NSPE recently joined the Professional Certification Coalition, which was formed in July 2018 to promote and represent private-sector professional certification organizations and their service providers. 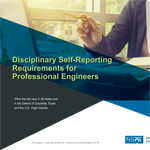 This membership provides NSPE with additional opportunities to protect professional licensure and contribute white papers and other material highlighting the benefits of both certification and licensure. Membership also allows NSPE to form new, mutually-beneficial alliances with other associations and organizations. NSPE has long known the benefits of working in a coalition—this past June, NSPE and an informal coalition of certification organizations successfully amended a Louisiana bill (H.B. 748) by stripping a provision that would prohibit the use of most professional certifications or accreditations within the state. This new coalition formally unifies the efforts of many of those same organizations. The PCC also recently issued a call for professional societies in all fields to submit comments in opposition to Ohio Senate Bill 255, another state initiative to roll back occupational licensure. NSPE, working with the Ohio Society, had already registered its opposition to the bill separately in May, but feedback from the bill’s sponsor is already indicating that the efforts of NSPE and the PCC have registered with lawmakers. The PCC’s members include both purely voluntary professional certification organizations and private certification organizations that issue credentials that state governments require for licensure in those professions. The PCC represents the interests of both kinds of professional certification programs in opposing legislation harmful to private certification programs and those they certify. To date, more than 40 organizations have signed on. Despite the diversity of the organization membership, the PCC has assured NSPE that it will not advocate for licensure laws that currently require professional certification to drop those requirements, nor will it advocate to expand government regulation of professions in which voluntary certification is currently the norm. For professions in health care, safety-related industries, and the financial and engineering industries, the PCC will support regulatory agencies incorporating licensure requirements and competency standards established by nongovernmental professional certification programs, as it would not serve the interests of certification and licensure organizations to shift enforcement from licensure boards to private certification programs.